The supplement Wild Maqui Berry has been developed to offer the medicinal properties of the small berries of this evergreen shrub. Its scientific name is Aristolochia chilensis, but it is more commonly known as maqui. Indigenous to South America, this shrub has been used for many centuries in traditional Chilean and Peruvian medicine, where its leaves and berries are used for treating a wide range of illnesses. The therapeutic virtues of maqui berries are due to their antioxidant potency. Maqui berries are recognised for their antioxidant properties - and with good cause, since they have one of the highest ORAC (Oxygen Radical Absorbance Capacity) values. With a value higher than that of goji or acai berries, maqui berries are particularly effective at eliminating free radicals, the highly reactive elements that cause considerable damage in the body. Alongside their high antioxidant content, maqui fruit also boast a nutrient-rich composition, including several vitamins and minerals, hence their reputation as superberries, superfruits or indeed superfoods. Maqui berries’ antioxidant potency gives them many medicinal virtues. In quenching excess free radicals in the body, they help fight premature ageing of cells and prevent the onset of certain diseases. Oxidative stress is known to cause significant damage at a cellular level, promoting the development of certain diseases. According to current scientific data, maqui berries may be particularly effective at helping to prevent certain cardiovascular diseases. The cardio-protective effect of these superfruits may also be boosted by a cholesterol-lowering action: consuming maqui berries may reduce levels of ‘bad’ LDL-cholesterol. The maqui berry is attracting increasing interest among the scientific community. Some researchers are interested in its therapeutic benefits for managing diabetes, while others are investigating its detoxifying properties, slimming effects or anti-fatigue action. Preliminary findings are encouraging, with one particular study having caught the attention of health professionals. This study examined the effects of supplementing with maqui berries on combatting sight problems. It suggested that such supplementation could restore healthy function to the lachrymal glands, helping to resolve the increasingly common problem of dry eye syndrome. 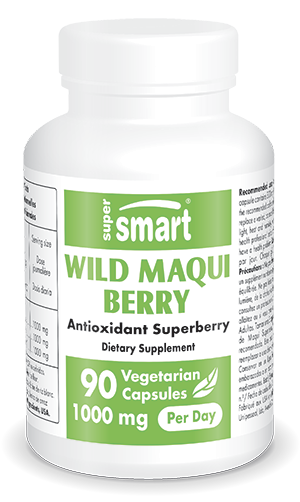 The benefits of these superfruits can now be obtained with this new Wild Maqui Berry supplement from SuperSmart. Each capsule contains an optimal 333mg of maqui extract (Aristolochia chilensis), with a suggested dose for this antioxidant supplement of three capsules, spread across the day. For optimal efficacy, it can also be combined with the powerful antioxidant complexes AntiOxidant Synergy and OptiVision.